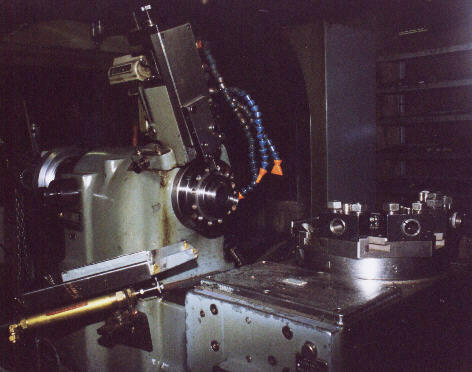 This is a circa 1980 CHNC with 16C spindle. 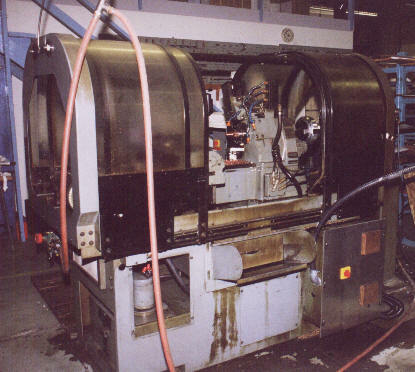 Like most such machines it is equipped with an 8-station turret, pneumatic collet closer, overhead cutoff slide, parts catcher, coolant system, and auto lube. 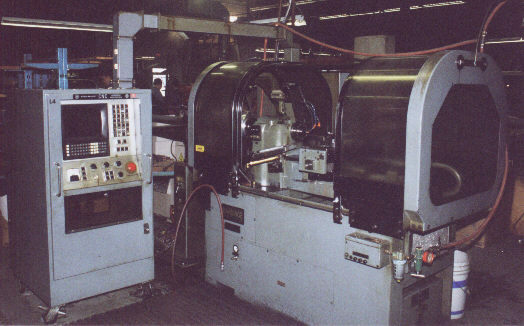 It was out of service due to persistent electrical problems in the old CNC control system. 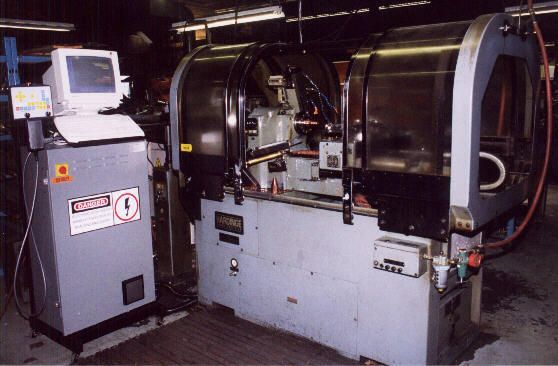 Here is the same machine less than a week later, back in service with the Centroid T39 control installed. All jogging and machine controls are provided in the walkaround pendant, shown here on the provided rack to the left of the color display. The original large electrical cabinet has been removed from the back of the machine. The new spindle drive and braking resistor, the contactor for the coolant pump, and the main disconnect switch are installed in the small interconnect cabinet. A new cover has been fabricated for that cabinet, with cooling fan and vent to ensure airflow for the spindle drive. All other control electronics are in the Centroid cabinet on the roll around stand in front of the machine. 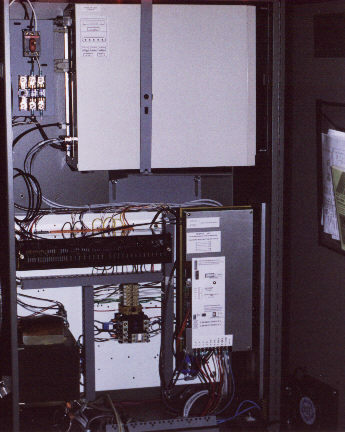 At top is the control computer; horizontally across the center is the PLC unit; at right is the servo drive. A newer generation of hardware and PLC software, and allowance for a little more on-site assembly time, has allowed me to move away from the cabinet-in-front style for CHNC retrofits, and instead put all the control electronics in the original Hardinge cabinet on the back. This frees up considerable floor space in front of the machine.